Yeowww! is exactly what I said when this arrived on my doorstep! What’s better than one Yeowww! 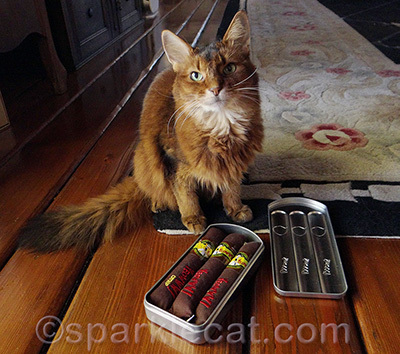 Catnip Cigar? 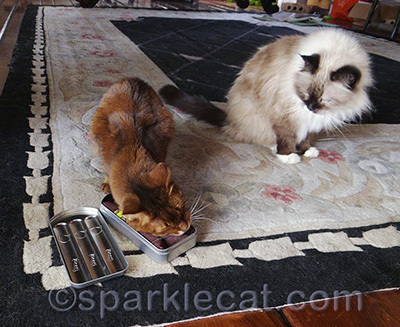 Three of them in a special designer tin! As many of you already know, Yeowww! 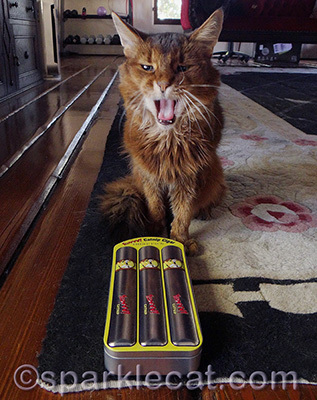 catnip cigars are especially potent. Well, imagine that tripled! This must be what cat heaven smells like. 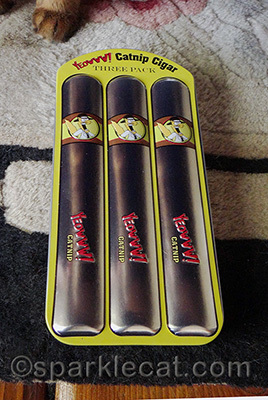 And with three cigars, there is enough to go around here! Even so, I’m not inclined to wake up Binga from her nap just now. 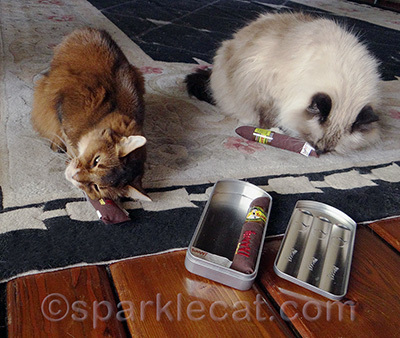 The best part of getting to try out this amazing tin of catnip cigars is that the Yeowww! humans said I could give away five of them to my readers! I am going to pick four winners using the Rafflecopter widget below. All you have to do is comment on the blog and say you did on the Rafflecopter widget (or let me know if you are having a problem with the Rafflecopter widget and I will enter you manually) — Rafflecopter also has other ways to get more entries if you want. And one winner I will choose from my newsletter subscribers (watch for an email on Monday!). 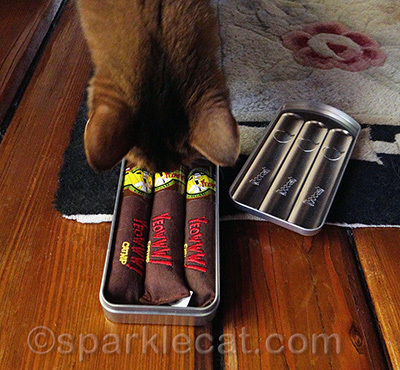 That means if you already subscribe to my newsletter, you have an even better chance to win one of these awesome tins! The giveaway ends Monday, February 3, at midnight Pacific Time. I’m sorry, but this is for U.S. residents only — I will have to make it up to you international readers another time. Good luck! those look awesome! Very cool contest!